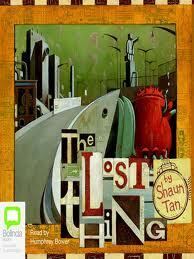 A fantastic win for Shaun Tan! He is taking home an Oscar in the category of Best Animated Short Film in today's Academy Awards. His film was based on his very popular children's book, The Lost Thing. Shaun Tan is an outstanding artist and deserves all the acclaim he receives now and in the future. He inspires many, many new and established illustrators and artists with his superb work..